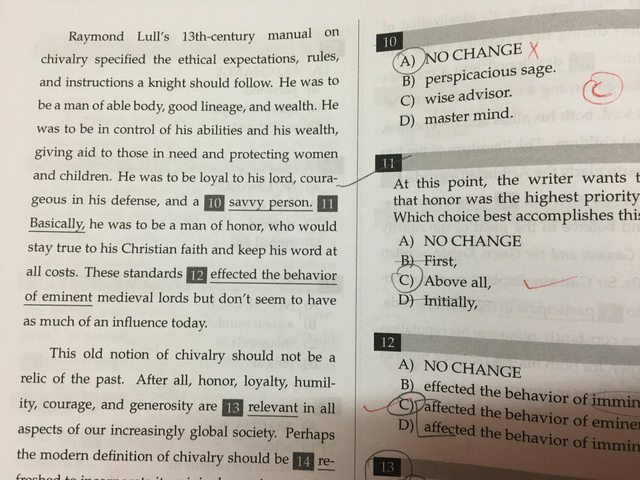 See Question 10 in the image. He was to be loyal to his lord, courageous in his defense, and a (10) savvy person. Basically, he was to be a man of honor, who would stay true to his Christian faith and keep his word at all costs. Here option B) perspicacious sage, is considered incorrect because it has a very complex language, which is not required for this passage. On the other hand, savvy person, C) wise advisor, and D) master mind are very similar to each other. These choices are even of normal tone. I tried to apply to the concept of parallelism and comparisons here: we are talking about a human (Man), so let's put man (savvy person) for right comparison and not bring mind and advisor here. However, I got it wrong. The correct answer is C.
"A savvy person" just describes someone who has a good, intricate understanding of something. In this particular context, since we are talking about someone's being usable for "the lord", what needs to be underscored is that the candidate helps the lord; he's not just a smart alec ("savvy person" would have a slight connotation of someone who keeps his knowledge to himself and profits from it). A "mastermind" is someone who is the main intellectual force behind some very specific project (very often, the project in question would be of negative nature—a crime like a terrorist attack; but the negative sense is not required). Again, here, what is needed is a person who would help in all situations, and not just in a specific project. While it is not slang (although some may consider it to be), 'savvy' is not really formal English. In the context of the article, which was quite formal, it does not sit comfortably and could be considered out of place. Not the answer you're looking for? Browse other questions tagged word-choice synonyms formality register or ask your own question. Why 'belie' rather than 'confirm'? Is 'good evening' more formal than 'good night'? Is “to” the better preposition than “for” in this sentence?